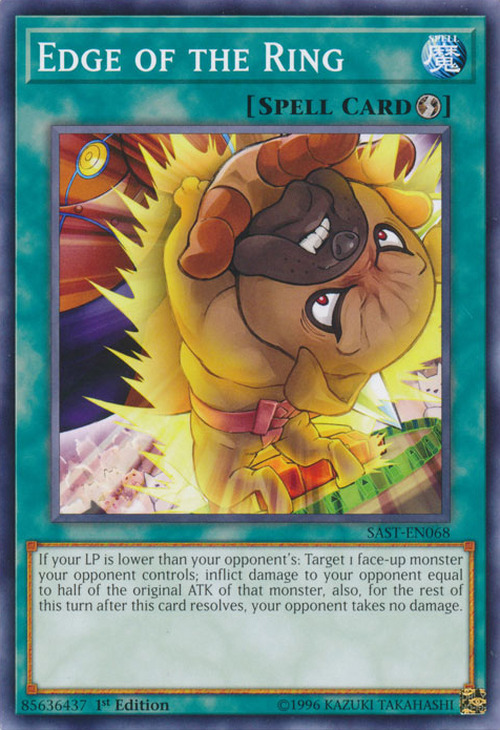 If your LP is lower than your opponent’s: Target 1 face-up monster your opponent controls; inflict damage to your opponent equal to half of the original ATK of that monster, also, for the rest of this turn after this card resolves, your opponent takes no damage. Yokotuner and Yoko-Zuna Sumo Spirit appear in this card's artwork. This is fitting, as both monsters are portrayed as Sumo wrestlers and are furthermore depicted partaking in a sumo match within a Sumo wrestling ring. Furthermore, their names are a pun on the word Yokozuna, the highest rank in the sport of sumo wrestling. The object of a sumo match is to force your opponent out of the dohyō, or the sumo ring itself. Yokotuner is shown teetering at the tip of the dohyō thanks to Yoko-Zuna, hence this card's name.